Type 2: Anti-Valentines day. Either scared by an ex or simply in a long term relationship with no time for the hype, and expense, of Valentines Day. At Travel Money Oz, we’re a bit of both. Whilst we are softies that love a good Hugh Grant movie, we too are slightly bitter from our experiences with an ex… Though perhaps not the ex you are probably thinking (we’re a company, it’s not possible for us to have a relationship). No, we’re not talking about meal deals that promise 10 nuggets and only give you 9; our ex is airport exchange rates. If we’re being honest we are still a little bitter about them, which is not ideal at this time of year. That’s why, this Valentines Day, we are hoping to catch the travel bug instead of the love bug. We don’t want to leave out the Type 1’s either, so why not celebrate your love by travelling the world! That’s #couplegoals if ever we’ve seen them. 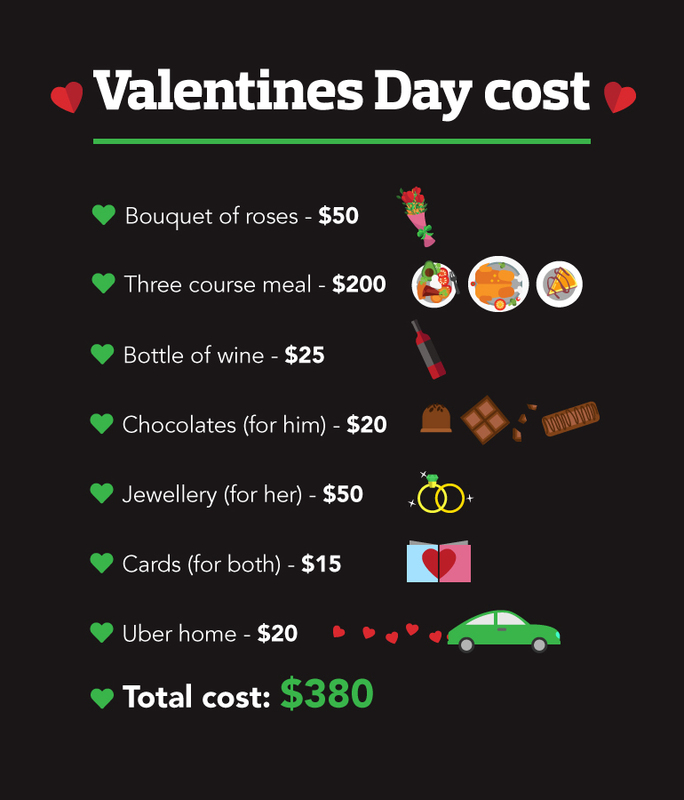 We did some very accurate* research on the average cost of Valentine's Day for a couple in Australia. *Look, they are pretty solid guesstimations based on previous experience and some local restaurant deals. You get the point though. Coming in at an average of $380, Valentine’s Day is E.X.P.E.N.S.I.V.E. Let’s just say you decide to save that $380 and put it towards a holiday. 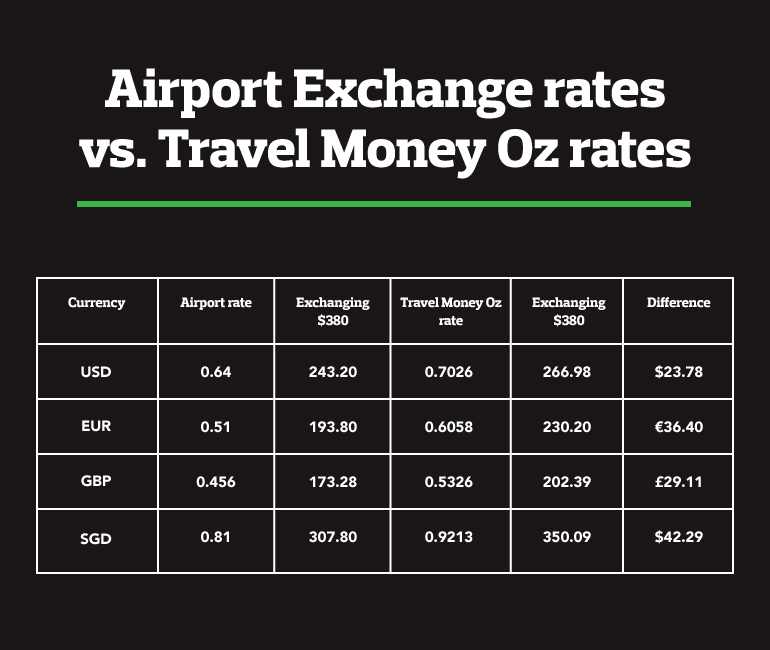 We’ve had a look at how much you would get exchanging that $380 at an airport, compared to purchasing from Travel Money Oz. As you can imagine, speaking to our ex was pretty traumatic, but the overall experience has really taught us that we truly are better off without them. See, we told you! Airport rates are the worst. This conversion doesn’t take into account their service fees or commissions either (don’t worry, Travel Money Oz doesn’t have those). It shows that, just like a relationship, you shouldn’t settle for what’s easy. Sure, it’s convenient to purchase your currency at the airport, but it comes at a pretty major cost. A little bit of research (or in relationship terms, social media stalking), combined with the ability to talk about what matters most to you (Best Price, Cash Commitment or Rate Guard?) will leave you with more money in your back pocket and an urge to start a long term relationship with Travel Money Oz. So, what are you waiting for? Ditch your ex and swipe right on your new flame. With over 165 stores across Australia and New Zealand, as well as a web store open 24/7, we’ll be there whenever you need us. Just like Aladdin, we promise that our relationship will show you a whole new world. From chocolate tasting in Belgium, scuba diving in Thailand and picnics under a sparkling Eiffel tower, there really is no better relationship than the one you’re about to start with us. Terms and conditions apply to Best Price Guarantee, Rate Guard and Cash Commitment. See travelmoneyoz.com for more details. Travel Money Oz rates are quoted from travelmoneyoz.com/foreigncurrency and are valid as of 5 February 2019. Airport rate was quoted over the phone with Travelex at Brisbane airport on 5 February, 2019 at 9:40am.